Here you can find tools and resources to educate yourself about the “disabilities treaty” (Convention on the Rights of Persons with Disabilities, CRPD), learn how to keep up with CRPD action alerts and news, and take action! But Which Senators Do I Talk to? Each of these should take about 5 minutes to review. UN CRPD for the USA: This 4-minute captioned film summarizes some of what is covered in the disability treaty (CRPD). CRPD Timeline: This somewhat long post summarizes key events in the campaign for U.S. ratification. DisabilityTreaty.org: Website by the U.S. International Council on Disabilities reviews what the CRPD is. It also has an Action Center that guides you smoothly through phone calls to Senators or allows you to sign a petition or send emails and twitter messages. These materials will take longer to review. For people who want to learn more. Community Webinar on CRPD: 48-minute captioned video reviews what the CRPD is, why US ratification matters, why so many organizations and stakeholders are involved, and how people can help. CRPD Timeline: Curious about the history of the national campaign for U.S. ratification of the CRPD? Review a timeline of events. U.S. International Council on Disabilities CRPD resources: Review some of the materials available in the CRPD section of USICD’s main website. Includes list of 850+ US organizations supporting US ratification of the CRPD, links to videos, letters from major organizations supporting the treaty, tools for advocates, news and updates on the campaign, etc. US Department of State CRPD Website: Materials from the US Department of State. Includes the full CRPD transmittal package that was sent to the US Senate. CRPD Teaching Kit from Handicap International reviews the basics of disabilities and human rights, the content of the CRPD, and its implementation and monitoring. The most important starting point for every advocate is: talk with U.S. Senators. 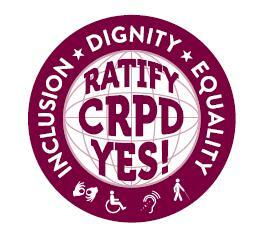 Ask them to support U.S. ratification of the CRPD! Email them, call them, visit their office, tag them in tweets about the CRPD, leave messages on their Facebook page. Phone calls and office visits are best if you can. But emails and other ways of communicating still help too. Want to do more? Check the section on “Ideas for Taking Action” further below. CRPD Action Center at http://disabilitytreaty.org: This Action Center supplies you with phone numbers and a script for calling the two Senators for your state. It also allows you to sign a petition and send emails and twitter messages to Senators. Phone numbers and email addresses for Senators who especially need to hear from CRPD advocates. How to Meet Your Senator: A personal visit to the office of a Senator has the strongest impact. Each Senator has at least one office in his or her state. This handout guides you through the process of scheduling a meeting with either the Senator or his/her legislative assistant for foreign relations issues. That said, you can call Senators from ANY state. If you have time to call more than two Senators, please do! CRPD Action Center at disabilitytreaty.org: Find a template email and template twitter messages that you can modify before sending. Find suggested script for phone calls. See sample language or messages in sign-on letters for individuals in the section below. As a general rule, always start with your own two Senators. It is good for all Senators to be aware that many members of the disability community support the CRPD no matter how they intend to vote. The Action Center at http://disabilitytreaty.org can help you identify your Senators and provides their phone numbers and a suggest script. Consider also calling Senator Harry Reid (Nevada). Make sure he knows that you want him to call a vote on the “Disability Treaty” (CRPD) in September. In his role as the Senator who schedules votes for the Senate, he represents all Americans. Ratify CRPD Facebook group: Use this Facebook page to exchange ideas with other advocates on how to take action. Report what you did and what the results were so others can be inspired to emulate you! Students4CRPD Facebook group: Students and faculty at US colleges and universities are using this Facebook page to organize themselves. USICD Facebook group: The U.S. International Council on Disabilities (USICD) is one of the key organizations leading the effort for US ratification of the CRPD. The DisabilityTreaty.org website by USICD makes it easy to take action in support of the treaty. Don’t overlook the links in the CRPD 101 and CRPD 102 sections above. Some of those links have tools helpful to advocates, particularly in educating others. Trying to spread the word about the CRPD? Find handouts you may want to print and disseminate at http://www.usicd.org/index.cfm/tools-and-resources. Talk to your senators! (See the sections further above on “How to Contact Senators” and “What to Say to Senators). Phone calls are best, but emails are also good. The CRPD Action Center at http://disabilitytreaty.org/action will be helpful to you. Ask friends and family to talk to their senators. And, talk with your own senators–again! Consider “borrowing” extra senators from other states and talk with them, too. Find Senators who particularly need to hear from CRPD advocates here. Although Senators strongly prefer hearing from residents of their own state, they do also count calls from other states. Yes, you can contact the same Senators on the same issue many times. Each phone call is counted. This is partly a numbers game: the side that generates the most phone calls to Senators is more likely to win. Ask friends and family to sign the CRPD petition. Consider organizations you know or are involved with. Ask if they have sent a letter of support for the CRPD to Senators: see examples from other organizations in the left hand sidebar of the CRPD supporters page at USICD’s website. Ask them to post their letter on their web site. Alert USICD so they can post a link to the letter from their website. Letters are welcome from disability, veterans, faith, business, parents, human rights, social justice, international development, and humanitarian organizations. In short, any organization that believes in equality and the inclusion of people with disabilities in society. Talk about the CRPD in social media–Twitter, Facebook, LinkedIn, Tumblr, blogs, etc.! (In Twitter and Tumblr, use hashtags #ISupportCRPD, #CRPD, and #DisabilitiesTreaty). Encourage your US followers to use the CRPD Action Center at http://disabilitytreaty.org to take action! Visit http://facebook.com/RatifyCRPD for more ideas from other ordinary advocates like YOU! Also, “like” and “share” the page with your Facebook friends. For students and faculty at US colleges and universities, visit http://facebook.com/Students4CRPD. Talk with senators! (Yeah, again!) And ask everyone you can think of to talk with them, too! The http://disabilitytreaty.org website often has the most recent updates and news about the campaign. Monitor regularly. Even better is to sign up for the CRPD Action Alert mailing list via the link.